Figure 4.7 MacConkey Agar This complex medium is differential for lactose fermentation and selective for Gram-negative rods that typically reside in the intestine. Bacteria that ferment the sugar produce acid, which turns the pH indicator pink, resulting in pink colonies. Lactose-negative colonies are tan or colorless.The bile salts and dyes in the media inhibit all but certain Gram-negative rods. 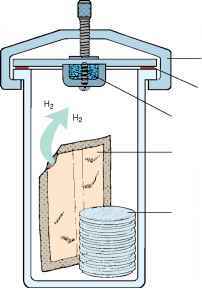 Figure 4.8 Anaerobe Jar The hydrogen released from the generator combines with any O2 to form water, thereby producing an anaerobic environment. the reaction of hydrogen with atmospheric oxygen to form water. The amount of hydrogen generated, however, is not enough to combine with all of the O2, so that conditions do not become anaerobic.